Growing up profoundly deaf in gritty Hamilton, Ontario, Gary Malkowski was always a fighter. Born several months premature, with an Rh factor, he was a fighter from the start. His family didn't learn to sign—they were counseled not to—so he experienced plenty of frustration. That changed when he enrolled in the Ontario School for the Deaf (now the Ernest C. Drury School for the Deaf—it was renamed in honor of Ontario's eighth Premier after his death in 1968). Although it was, at that time, an oral school, signing was allowed outside of the classes, during recess, after school, on the playgrounds, and in the dorms. "I got most of my education outside the classroom," he says. He majored in Psychology and Social Work at Gallaudet College, and worked for the Canadian Hearing Society, which serves the entire deaf, hard-of-hearing, and deafblind population of Ontario. He taught at a local college, got involved in grassroots advocacy, and helped organize protests against government inaction. Richard Johnston, a former MPP (Member of Provincial Parliament—the Canadian counterpart of a state legislator) from the New Democratic Party, encouraged Malkowski to run for office. He joined the NDP, and in 1990, he ran for election as an MPP. Since he doesn't use his voice, he adopted an unconventional form of campaigning—using a sandwich board—and was shocked to find that he'd won a Parliamentary seat. He represented the riding (electoral district) of York East, a borough of Metropolitan Toronto. As Canada's first Deaf MPP, he seized the opportunity to introduce bills granting official recognition to ASL and LSQ, and other measures enhancing the lives of Deaf Ontarians. He	served	a	5-year	term. Malkowski is a magnificent signer. He was the first deaf member of any parliament to address a legislature in sign language—ASL in his case. Canadian parliaments can be noisy and rowdy, with MPPs shouting each other down. When Malkowski delivered his first address, with an interpreter stationed nearby, there was a respectful silence as all of the other MPPs watched and listened, enthralled. 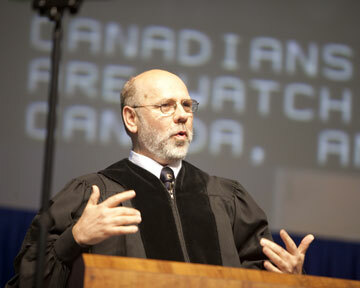 He's now Special Advisor to the President, Public Affairs, CHS.On May 12, 2011, Gallaudet University, conferred an honorary Doctor of Humane Letters on its illustrious Canadian alumnus. He said, "This is the highest recognition I could ever have imagined."